How are you today? This week, nothing much happened on Stardoll. Which is kinda okay. Of course, I love when Stardoll keeps updating stores and game often, but sometimes, we need a break, time to refill our virtual wallets. Of course, I am hoping for something interesting next week. But before that, let's see what happened this week. On Monday, we got new Tribute collection - Heritage Classics tribute. Interior collection to be exact. Yeah, many users are disappointed (myself included) that we did not get clothing collection, but interior instead. I was really looking forward to their signature bags. Ok, we did get one, but with a cat inside, and it is hardly wearable, it is supposed to stay next to your doll at least. Anyway, the dominant color is orange, which is bright and perfect for summer. Bike is nice, but notice something odd - a horse in living room. Anyway, collection is nice, but of again, why not clothes collection?? On Wednesday (finally) we got new Callie's Picks collection. The overall theme centers about floral patterns and design. Items are really beautiful, and we got some semi-rare items. I am really glad they did not decide to got with 4th of July theme - no offence to US residents, but I am not really a fan of black-red-blue color scheme. And I think we had a collection centred around the theme. Anyway, beautiful collection, but what I really want re-released are some older starcoin items, which are impossible to find, and no one wants to sell items for kinda useless coins. And on Friday - no, not another limited collection - just an 'ordinary' Fever collection. Items are nice, perfect for summer. I love colors and patterns, there are mostly white items, with some nice accessories. Still, I am not a huge fan of the collection, and will be probably waiting for 50% off closing sale, like we got last 2 times Fever store was leaving. Those shopping bags are great, too bad they are superstar only, which I discovered a day after my superstar membership ended. 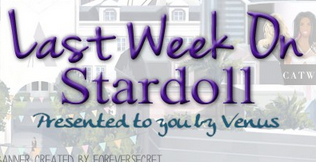 - new weekly Star Designer, surprisingly, it is the user from my country - congrats! - Stardoll published a video about a user who, through Stardoll, discovered her sense for fashion and started designing real life clothes - congrats to you too! - We will be possibly getting new HotBuys retro collection, according to spoilers some users posted. That sums up the week. Looking forward to the next one. Until then, vote, comment, and see you next week.